It's been 5 years since the release of the movie version of the 4-episode Armitage III OVA known as Armitage III: Poly-Matrix. Back then, anime VHS was still going strong, laserdisc was slowly fading away, DVD was the new kid on the block, and Pioneer still used the old white omega sign logo. 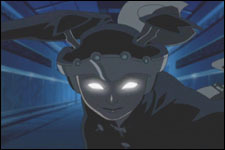 Poly-Matrix suffered from some big plot holes and a rushed feeling that stemmed directly from the fact that the OVA was a full 50 minutes longer than the movie. Despite the story being rather baffling, what was left was an action tour-de-force. 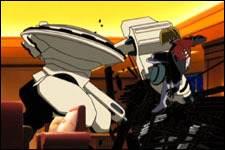 Viewing the original OVA series, with its much brighter ending, helped to answer any dangling questions and logic gaps that the movie spawned. Sadly, fans of the OVA will have to hold out just a tad longer for a DVD release, but the wait may be worth it with a resurgence of interest in Armitage on the way thanks to a brand new movie. Yes, that's right, everyone's favorite android assassin is back, and so is her main squeeze, Ross Sylibus -- now known under the alias Kevin Oldman. What's more, the movie picks up 5 years after the end of the first one with Ross and Armitage taking on assumed names and living a happy and quiet life on Mars with their daughter Yoko. Yes, Armitage gave birth to a healthy baby girl who's grown into a cute little Kindergarten student. Armitage has even grown up a bit herself -- looking less like a punked out child and more like an attractive PTA mom who occasionally runs around in a more sensible red and black jacket with her skimpy shorts hidden from sight. Ross, on the other hand, is still the same old giant ox he's always been, except now he works as a security guard who ends up living as dangerous a life as he always has. Ross has always had a hatred of robots, but after an accident that lift him crippled and his partner dead, he was forced to take on robotic parts in order to live a normal life. This, combined with his love for Armitage has lead him to take on a pro-robot stance and with the Robots Rights Bill about to be decided, Ross has become one of the key supporters of the bill. His views bring him to Chicago for a summit between Earth and Mars to decide the matter. 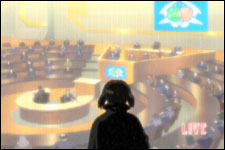 However, Yoko is kidnapped by Demitrio Mardin, the president of the Earth Robot Union, in order to hold her for ransom to force Ross to vote against the bill. Just days prior, Armitage had taken off for Earth after witnessing the last memories of a third who was brutally executed on Earth by military forces who brought down one of Demitrio's illegal third production plants. It seems there is more to this incident than at first meets the eye. 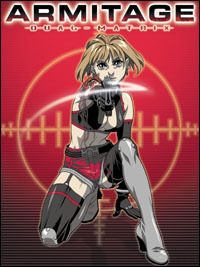 For anyone who has seen the Sol Bianca: The Legacy OVA series from 2000, the look and feel of Dual-Matrix will be easy to get used to. The movie is a blending of 2D animation and 3D backgrounds and vehicles that draws the viewer into a very believable world. Since the movie is 75% action, the CG additions only help to heighten the tension that mounts throughout the entire 90-minute experience. The fight scenes themselves are intentionally jerky in nature with fast movements that will make the viewer cringe from the impact -- especially when someone gets kicked in the you-know-where. Armitage: Dual-Matrix sports an entirely new English voice cast, featuring the voice of Juliette Lewis (From Dusk Till Dawn, Natural Born Killers) in the lead role of Naomi Armitage. Overall, Juliette's voice lends a less robotic and way less angst-ridden character than the way Elizabeth Berkley portrayed the character in Poly-Matrix. While the rest of the voice cast does a superb job bringing their characters to life, there is one minor character of particular note. This voice is the eccentric android repairman, Mouse, whose voice will undoubtedly be instantly recognizable to any fans of Star Wars. Yes, Mouse is voiced by none other than Jar Jar Binks himself, Ahmed A. Best. Pioneer is pulling out all the stops with the release of Armitage: Dual-Matrix, with a total of four releases to choose from. First is the standard movie-only DVD release which contains the movie with no extra frills. The second version, and the version most fans will likely pick up, is the Special Edition DVD which features a foil enhanced cover sleeve, a 16-page character guide, and DVD extras such as a short featurette, 5.1 music only track, 60-image design art gallery, and movie trailer. There are also two other cool releases for the movie as well. One is a box set of the first movie and the special edition of Dual-Matrix and the other is a lunch box with the special edition DVD and a variant color version of McFarlane Toys' Armitage action figure. Dual-Matrix is a movie that ties up a number of loose ends and delivers virtually non-stop action and plenty of intrigue. It's like a trip down memory lane, and fans are sure to enjoy the chance to visit with these characters one more time. Armitage: Dual-Matrix hits store shelves June 25 and is sure to have fans everywhere screaming for more. 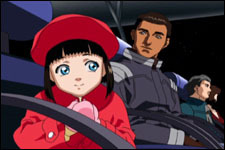 The daughter of Naomi Armitage and Ross Sylibus, Yoko is the first child to be born to a human and an android. Yoko has grown up believing her mom to be a normal house wife and her dad an average security guard. Overall, Yoko is an average four-year old who doesn't display any abnormal tendencies. In fact, she is just like any other kid her age. A Chicago resident, Mouse is an eccentric electronic repairman who runs a business out of his colorful van known as Mouse Robot Service. Mouse seems to be an android, or have android parts himself, and doubles as a secret informant that is willing to sell any information to a willing buyer if the price is right. Images Copyright AIC/Pioneer LDC, Inc. Copyright Pioneer Entertaiment (USA) Inc. All rights reserved.